We use state-of-the-art technologies to provide crucial services for our customers such as optimising asset efficiency and preventing failures and breakage. To give you access to information regarding your assets in real time, the BLP (Bharat Light & Power) company worked in partnership with EDF EN Services to develop the Orion Internet platform. 100% secure service accessible 24 hours a day via the Orion website or mobile application enables you, among other things, to monitor production; track key indicators; and display and export production histories. LIDAR, which resembles tripod-mounted field glasses, is an instrument for measuring actual performance. 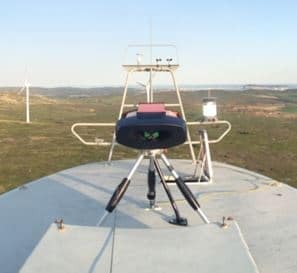 The laser system precisely measures wind speed and direction upstream from the turbine. The power curve obtained is used to correct the potential yaw misalignment and thus optimise the performance of your wind farm. EDF EN Services uses ground-based photographic inspection to monitor changes in the external blade structure, assess blade condition and anticipate the appearance of damage. The safe, reliable and flexible solution eliminates the need for working at height. EDF EN Services developed a predictive solution to supervise and analyse your transformer data. The objective : to reduce production losses. Thanks to the dissolved gas analysis, a high quality remote supervision is set up to ensure optimum working conditions of transformer and extend its lifecycle. A radio-operated model dirigible is used to carry out non-polluting infrared airborne thermography to detect defective modules and disconnected module chains. The infrared camera rapidly identifies temperature variations that indicate a production anomaly and pinpoint the area requiring repair work.